Pull this Lemony Romaine and Avocado Salad out of your back pocket when you need a quick side. You can also beef it up to make a meal. Disclosure: I received a free copy of Simply Vegetarian Cookbook by Susan Pridmore for review purposes. This post contains at least one affiliate link, which means if you click it and make a purchase, I may earn a tiny commission. All opinions are my own. I virtually met Susan Pridmore of The Wimpy Vegetarian during my Sunday Supper days. Her recipes always stood out as being fresh, healthy, and aligned with my food philosophy. When I found out Susan had written a cookbook, I couldn’t wait to get my hands on it! 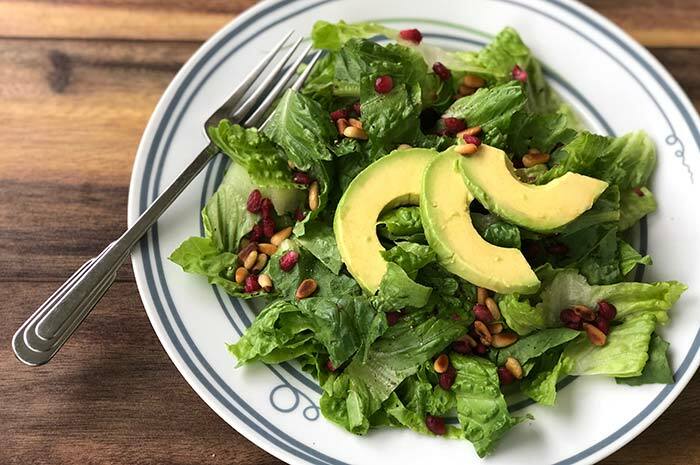 This Lemony Romaine and Avocado Salad is one of the first recipes I tried from Simply Vegetarian Cookbook: Fuss-Free Recipes Everyone Will Love. You won’t believe how such a simple, vegan salad can have so much flavor! I had some Citrus Vinaigrette in my refrigerator, so I used that instead of making the Lemon Vinaigrette below. Summer isn’t pomegranate season, so I used some seeds I had in the freezer. They were a little mushier than fresh, but I did like the pop of color. The CompostMaster added some smoked salmon on top of his portion and made the salad a meal. I toasted my pine nuts in a dry nonstick pan for a touch of smoky flavor. I originally made half of the recipe (3 servings) for the CompostMaster and me. He ended up making another batch because he liked this salad so much. Kudos, Susan! In a small bowl, whisk together lemon juice, mustard, salt, and pepper. Gradually whisk in olive oil. Layer the avocado slices on top of the lettuce in the bowl, and drizzle half of the remaining dressing over them. Carefully toss using your hands or a large metal spoon. Add the remaining dressing as needed. Susan says: This is my go-to side salad, although I eliminate the pomegranate seeds when I can't find them outside of the late-fall and winter months. It's extremely flexible, as all side salads should be. Sometimes I use Bibb lettuce mixed with the romaine. Other times I turn it into a main salad by adding cauliflower or broccoli florets, or slices of beets and a dollop of goat cheese. Any way you make it, it's a great little salad to have in your arsenal. Me too! I think it will soon become one of our favorites. Pine nuts and avocado must be a really yummy combo! Kari – It’s a fantastic combination! Can’t believe you don’t hear of it more often. I just got her cookbook too!! I can’t wait to try some of the recipes. They all look delicious! Liz – You’ll love the book! i love avocado and romaine salad,its all natural and looks lovely,people think about fat as a cholesterol its not true,natural fat its good for you but processed fat is bad for you,i will recomment avocado for diabetes people,well done. Mourad – Thanks! I’m firmly in the “avocado is good fat” camp.